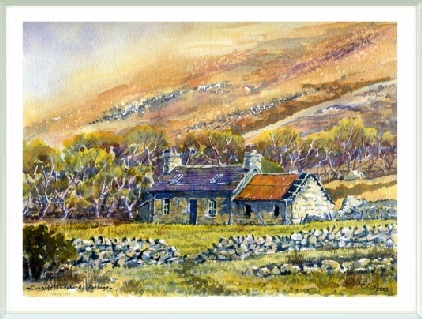 The old shepherd’s cottage at Cunside nestles below Sgor Chaonasaid, the front crag of Ben Loyal. Folk climbing the Ben from Ribigill Farm will pass the cottage as they start up the steep slopes to the left of the crag. However, a much more interesting way from the cottage is to bear right below the front crag and to climb diagonally through a scattering of silver birch to the wide grassy bowl between the 2nd and 3rd peaks before ascending to the summit, An Caisteal, at 2504 feet (765 metres). This route is longer and steeper, but far more rewarding. The quick, easy, obvious ways are not necessarily the best, whether your mountain is a Scottish Ben, or some other challenge of life.